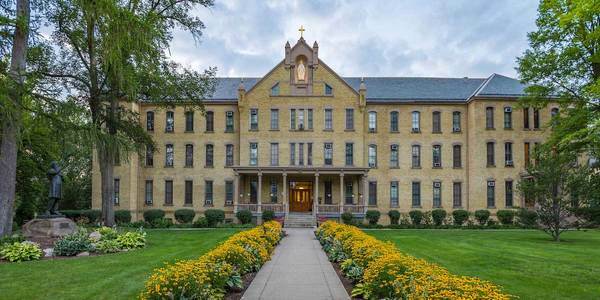 This summer, after more than 120 years of continuous use, Corby Hall will be razed to allow for an updated facility that better suits the needs of the Congregation of Holy Cross. Corby Hall is the on-campus residence and center of hospitality for the community of priests and brothers. A new Corby Hall, with a strong resemblance to the original, will be constructed in its place, which is west of the Basilica of Sacred Heart and south of the Grotto. The project was announced last fall. The sidewalk south of the Grotto will be closed during construction. The steps on the south side of the Grotto will remain open. The portion of Corby Drive directly south and parallel to Corby Hall will be closed off the duration of the project. Vehicle access to the Basilica, Sorin, Walsh, Coleman-Morse, etc. will remain open. Holy Cross Drive, the road that frames campus from the south, west and north, will remain open unless utility work needs to take place at the intersection of Holy Cross and Corby drives. The campus community will be notified before scheduled work. Construction for this project should be complete in the spring of 2020. Originally published by Department of Facilities Design & Operations at construction.nd.edu on May 25, 2018.